The Milestone Acceptance Signoff Form is used during a project with multiple milestones. At each stage of the project, the developer and client signoff on the acceptance of the project up to that point. Sometimes milestones also mark when payments are due (depending on the contract). Using multiple acceptance milestones also provides an extra level of safety by keeping the client involved during the course of the project to make sure it progresses and operates as intended. Failure to keep the client involved during the course of a project can lead to costly redesigns and reprogramming. This Contract Milestone Acceptance Signoff Form is included in editable Word format that can be customized in Word or by using the included Wizard software. General Description of Project Deliverable. Please initial the following sections which detail the project deliverable contracted between Company Name and Company Name and sign the Acceptance of Agreement at the bottom of this page. Initials Description of Completed Milestone. Acceptance of Milestone #number here: Milestone description here. I certify that I have received the above project deliverable from Company Name, and that the deliverable listed above has been demonstrated, delivered or otherwise completed to my satisfaction. 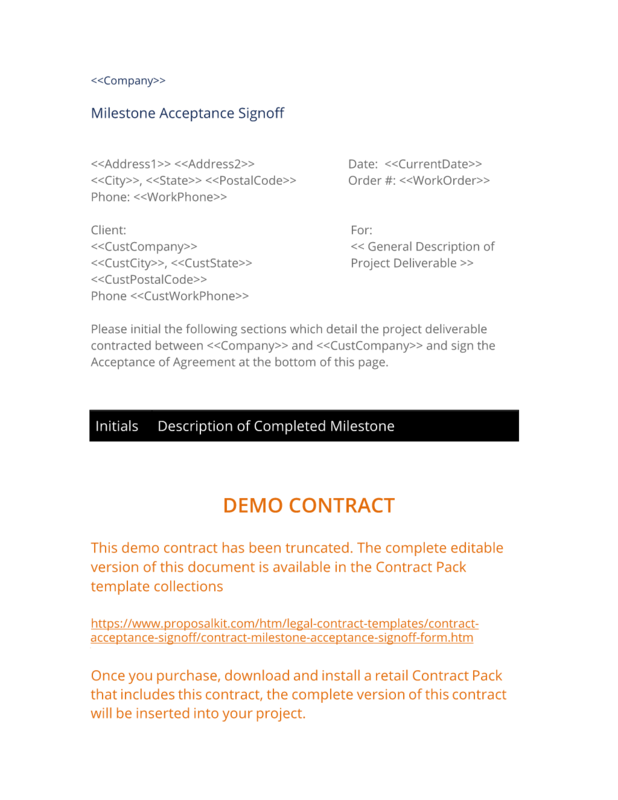 The complete Contract Milestone Acceptance Signoff Form - with the actual formatting and layout - is available in this Contract Pack.